Hey friends! I’m going to start adding more candid life updates to the mix on ze blog. You’ve been asking for more behind-the-scenes, so consider this extra content you can dive into! It will be quick, journal-like, and easy. You dig? Alright, let’s get into it. Last week was quite an exciting whirlwind! Andrew and I were in Colorado for Thanksgiving, we got engaged (proposal story coming soon! ), and then I flew out solo the next day from CO to LA for work. It all happened so fast, but I’m glad everything unfolded the way it did. While my time in LA was short, it was just what I needed to slooow down and let it all sink in on my own. I didn’t have to work until my second day in LA, so I decide to go solo for the afternoon - a little challenge for myself to enjoy being my own company for the day. I decided to sit at Café Gratitude, enjoy the sunshine, and reflect on an incredible week. I love Café Gratitude, because it’s super accommodating for gluten-free, everything is organic, AND they strongly support regenerative agriculture (something I’ve started learning more about). *Regenerative Agriculture is a farming practice that helps reverse climate change by restoring soil health (i.e. replenished water cycles, restored fertility, regenerated ecosystems). All of which can sequester carbon from the atmosphere. Woo-freakin’-hoo. Later that evening, I saw two friends Britney (@fittybritttty) and Rachel (@justdimpleit) for dinner at Gracias Madre. The restaurant is actually run by the same owners of Café Gratitude! It was a wonderful time catching up, and I’m truly so grateful for all of the friendships Instagram has helped me foster. The food was good, but I will say it’s not as accommodating for my particular food allergies. Eating both gluten AND corn-free was pretty tricky there. My favorite was the cauliflower special. I woke up, walked to get some matcha, and then went to breakfast at…. Café Gratitude. What can I say? I’m a creature of habit (and convenience, because I know I can eat there without any hassle). At this point, I was finally able to share with you all on Insta WHY I was in LA. So, whyyyy was I there? 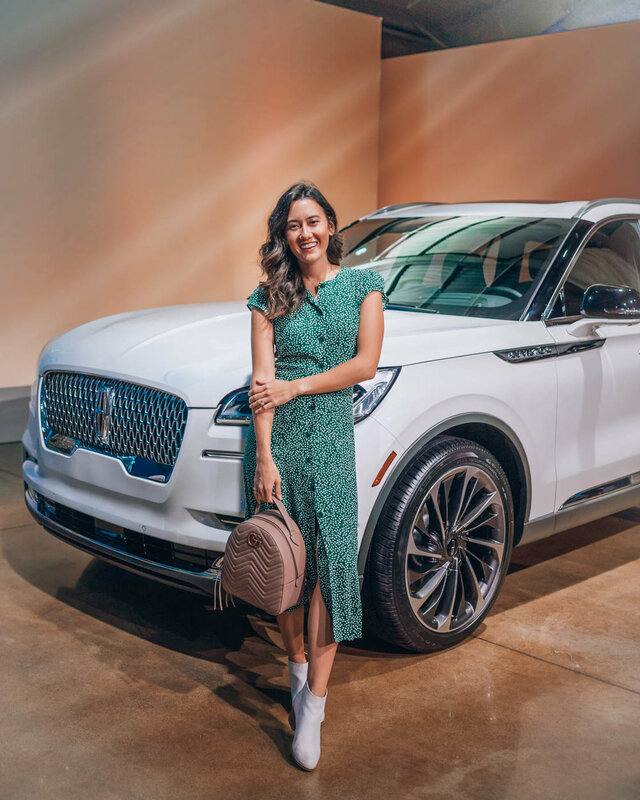 Lincoln Motors invited me to the world premiere launch party of the All New 2020 Lincoln Aviator. Since my fiancé (will I ever get used to sayin' that?!) is a tech dude, his love for new innovative technology has impacted me quite a bit over the years. My interest in technology combined with my continuous effort to live a more sustainable life pretty much sums up the qualities of this new Lincoln. The Lincoln Aviator is a hybrid, meaning it is powered by twin electric and gas engines, which is cleaner for the environment. Not to mention, it has seat massagers, parking assist (I need this, haha), and a legit sound system. It's pretty freakin' cool, and I'm so glad I had the chance to learn all about it. I ALSO learned that the LA Auto Show is one of the most consistently green auto shows in the country! I didn’t get to attend, since I had to fly home the next day, but knowing that makes me very happy for our future. Cars are major contributors to air pollution, so it’s great news that hybrids and fully electric cars are a trend that continues to progress. Andrew and I don’t personally own a hybrid or electric vehicle yet, but we share one car and are very conscious of our footprint. Andrew bikes to work every day and I work from home, so we only end up filling our tank maybe once or twice a month. So, that was my trip! I had a blast in LA with Lincoln. I made new girl friends in the industry, ate sushi at Sugarfish for the first time, and I even got to meet one of my favorite Youtubers, Wah at the launch party! I’ve been following him and his girlfriend Weylie for almost 7 years. It’s crazy, so I had to get a photo. It was one of those, 'Do I know you? You look familiar’ kinda moments. Hope you enjoyed this fun lil recap! Let me know if you enjoy seeing this kind of content in the mix!